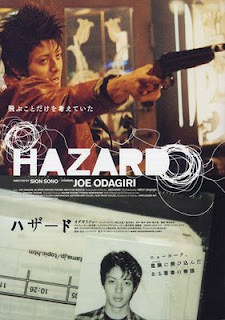 Our Must See Asian Films for this week is Hazard, another film startting Jo Odagiri. I had no background about this movie before watching it except that it starred one of my favorite Japanese actors, Jo Odagiri. Much like some of his best movies, I expected something cerebral. I was ready to jump into a vortex of subtly implied story twists. Oh, I jumped into a vortex alright... but it was one that twisted me around a tornado of unfulfilled dreams and embarrassing failures I have been too ashamed to face. Click here to read Sway, Jo Odagiri's best film to date. Shin finds himself bored and unhappy in Tokyo. He has always wanted to go somewhere exciting. When he read about the hazards of New York, he left everything behind to begin his journey to experience New York. Many of us dream of something bigger, something more, something different than what we are born into. The rich wants freedom from the obligation of money while the poor wants freedom from the limitations of not having any. People from smaller towns want the glitz and glamour that big buildings and expensive suits can afford while the the people from the city envy the country for their quiet, peace and authenticity. Desire is as natural as breathing and as old as living. That’s exactly what the movie is and that's why it's a must see Asian films. It’s a story about the most natural thing in the world, the desire for more. It progresses into an exploration of the reality of what we desire. We often paint an image in our head, an ideal that we want to find ourselves in. More often, we do end up getting what we want but it doesn’t turn out to be what we imagined it would be and that’s what screw us the most. That’s what this film is all about. It’s a reflection of how our eagerness to pursue our ideal blinds us from seeing that we have already been living our dream all along. The movie was show almost entirely in New York which adds authenticity to the already gritty treatment of Shion Sono. By using handheld camera and “actual New Yorkers” as extras, Sono was able to capture New York from the point of view of a visiting Japanese. Sono was able to capture that sense of chaos mixed with glamor. He will put you in awe New York’s grandness which will add to the depth of your disillusion as the film progresses. Come back for more must see Asian films.